WEST HOLLYWOOD:The not-so-secret lives of bees: the latest swarm has been reported on the Strip, where pedestrians were sent fleeing across Sunset. End of days? ECHO PARK: The winds of change continue to blow through Echo Park (the neighborhood was recently announced to be one of the finest in the country. Clothes, pizza, books--all coming soon to an EP storefront near you. 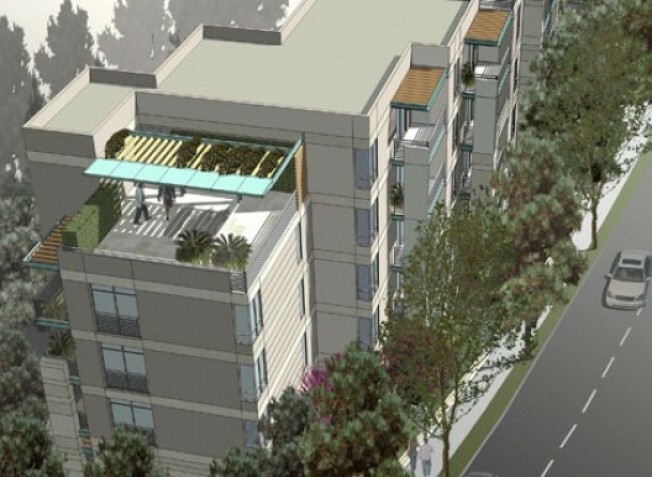 WEST HOLLYWOOD: A huge, modern apartment building could be moving in near Cedars-Sinai. First a brownstone development, now a layered thing from the future, Greenwich Place has got a green light from the city, and a great location, going for it. BEVERLY GROVE: We got an advance look of what could be the city's first multi-use prefab housing complex. A wooden wonder, the project is in pre-construction phase and will feature eight units from architect Work/Plays. SOUTH LA: A judge has sided with community activists, saying two crossings of the under-construction Expo Line--a light-rail connecting Downtown to Culver City--is too dangerous, and pedestrian bridges need to be built for the children who go to school near the contentious intersections. The judge doesn't have the final word, but the line may now be delayed a year or so from its 2010 scheduled opening. WEST HOLLYWOOD: The party's over for wild childs wanting to hang off the balconies of the old Riot Hyatt on the Sunset Strip. The redesigned hotel, opening January 1, is enclosing its terraces in "glass greenhouses." Behold the new Andaz West Hollywood. BEVERLY HILLS: It could be back to square one for 9900 Wilshire, the luxe condo development. Because financing for 250 condos is hard to come by these days, part of the project might have to become a hotel and then its back to the entitlement office and all that annoying bureacracy. And the developers don't want to use Middle Eastern money for financing; is there any other kind at the moment?